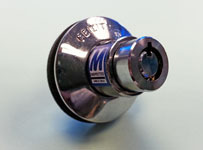 Quality high security locks for retail sales area showcases and display cabinets. 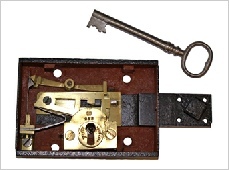 This is the earliest known Chubb Detector lock made in December 1819. It was found on a Carron cast iron strongbox - do you know of an earlier Chubb lock? We're always looking for older locks and keys (c1950 to pre-Industrial revolution) to preserve in our historic reference collection. Can you help? Fits to the rear panel of a pair of sliding doors. Requires a 22mm dia. hole drilled in the glass. 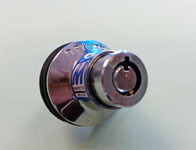 The new style lock is fully compatible with the old style. 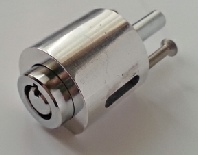 No drilling required, this lock simply clips on. Also comes with anti-pry wings. Supplied with a 48 mm flat cam as standard, cranked and or notched cams can be supplied if quantities permit. Requires a 20 x 43 oval hole in the glass. Inserts: plain, threaded & peg. Replacement Keys, Freeslide & Heavyslide runners. Top track, Glazing track and bottom track, we can also supply end caps, locking systems and silencers, also supplied as kits.